India is globally known for its demographic, cultural, historical and geographical diversity. Surprisingly, the history of Northeast India is not part of this diversity in school textbooks of the mainstream India. The northeast Indian states – Assam, Arunachal Pradesh, Tripura, Nagaland, Manipur, Mizoram, Meghalaya and Sikkim – are more popular as tourist destinations than historical parts of India as a whole. Evidently, a majority of Indians in the mainland are ignorant about the history and cultural heritage of Northeast India. A 12-year-old Assamese girl did what activists and educationists from Northeast India could not do to draw a nationwide attention to the lack of inclusiveness in the current education system with regard to the history of Northeast India. 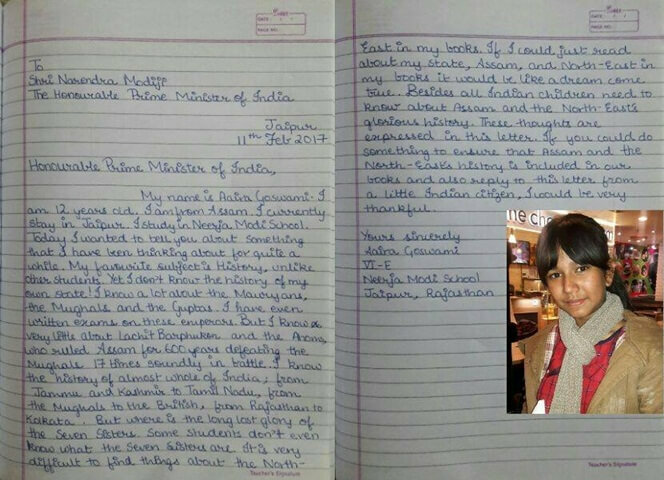 Aaira Goswami from Assam wrote a letter to Prime Minister Narendra Modi and requested him to incorporate some lessons on the history of her state as well as other northeast Indian states into the school textbooks on Indian history. Aaira Goswami from Assam is currently studying in Jaipur, the Pink City. Struck by the lack of diversity in her school textbooks and lessons on Indian history, she felt a strong urge to bring this issue to the notice of none other than Prime Minister Narendra Modi. The following excerpt from her letter to PM Modi is a testimony to what young Indians like she from the northeastern region of the country feel in the mainland. Aaira Goswami also wrote unhesitatingly in her letter to PM Modi that history was her favorite subject unlike other students of her age. Yet she knew a very little about the history of her native state and Northeast India as a whole. She read a lot about the Mauryans, the Guptas, the Mughals, and the British in her school textbooks, but the same books of history taught her nothing about the Ahoms and the Borphukons who defeated the Mughals seventeen times and ruled Assam for six centuries. 12-year-old Aaira Goswami addressed herself as a little Indian citizen in her letter to PM Modi. She concluded the letter with an earnest plea to have the glorious history of Northeast India included in school textbooks, and with a hope to hear from the Prime Minister. We at Travel Beats, a portal for Indian Diaspora by Indian Eagle, are sanguine that her eloquent letter and sincere request cut an ice with the Ministry of India so that Indian history could be taught as a whole, not in part.